I learned that lampas is a type of double weave with many possible variations. There are variations that have some areas with “pockets” between layers and variations with “tied” layers that have no pockets, and different yarn sizes can play an important role in lampas. My experience with this weave comes from studying Alice Schlein’s enlightening e-monograph, Lampas for Shaft Looms. This monograph is a real treasure, covering just about everything you always wanted to know about lampas including block, straight, and networked threadings, even pick-up lampas, and much more. I was searching for a new challenge and this was it! After inspecting all my samples, I decided to use the following specs to weave tied lampas cloth to make the pillow: warp ratio of 2:1 plain weave for the primary warp and 3-end straight twill for the secondary warp. There are no pockets at all in the tied version so the cloth is more stable. I created the draft below (front view for my rising shed treadle loom, using 11 shafts and 9 treadles) that shows two repeats of each threading block (9 units per block) and one repeat of each treadling block (12 units per block). For this project I repeated each threading block two times and each treadling block also two times, manually substituting the corresponding blocks in the profile draft. The tie-up shows a skeleton tie-up and 2 treadles have to be pressed at the same time for each weft shot. I wove it this way and it was actually a lot of fun! In Fiberworks you can use block substitution to automatically generate a thread-by-thread draft of several types of lampas from a profile draft, and you can choose a normal, skeleton, or liftplan tie-up. But none of the types of lampas listed was what I wanted so I did the substitutions manually. 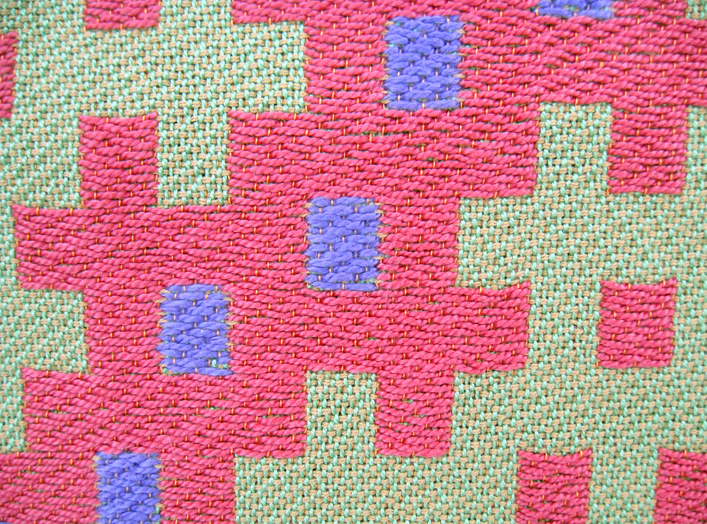 A few notes about how I wove the cloth for the pillow: primary warp – 10/2 light green perle cotton, secondary warp – 40/3 orange quilting cotton, primary weft – 20/2 (2 strands together) beige unmercerized cotton, secondary weft – 5/2 coral pink, purple, and yellow perle cotton; warp ends per inch – 30 (3 per dent in 10-dent reed, 2 primary and 1 secondary per dent). While the coral pink weft is loom-controlled, the purple and yellow wefts are inlaid by hand. The cloth was finished by hand washing, air drying, and steam ironing. The finished cloth is about 26 inches long and 21 inches wide. 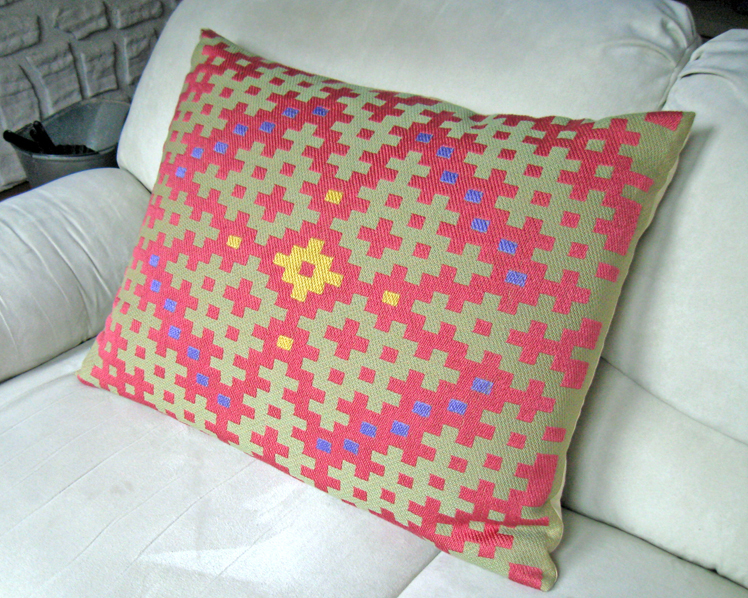 The close-up photo of the pillow shows the pattern exactly as it appeared from the front of the loom as I was weaving while the pillow on the sofa is on its side so the pattern is turned. The photo below is a close-up of a lampas table runner that I designed and wove showing front and back. I like both sides equally and use it either way. It’s also 2:1 tied plain weave and 3-end straight twill with the same threading but different tie-up and treadling than the pillow. 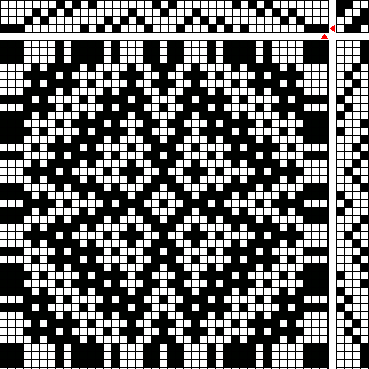 Next are two photos, front and back of the same sample, illustrating 2:1 plain weave in both the primary and secondary cloth. The bottom half of each photo shows tied lampas and the top half of each shows untied lampas. I find the subtle differences very interesting. This has been another enjoyable and exhilarating weaving experience! 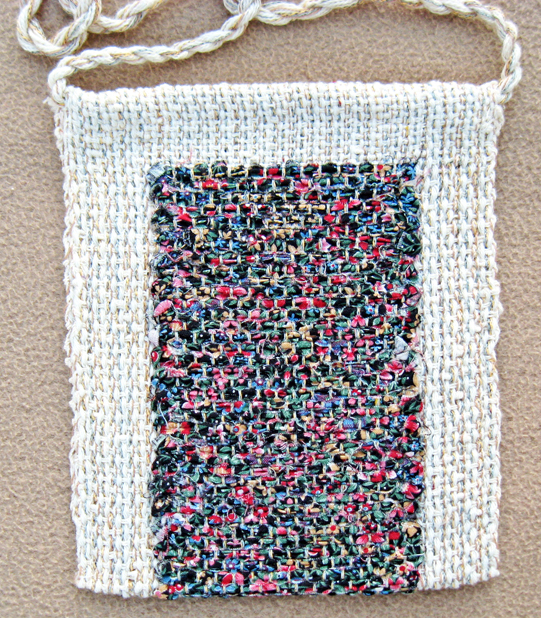 UPDATE November, 2018: I developed an article from this blog post that is published in the October 2018 issue of the Complex Weavers Journal, “Lampas and Moorman Inlay Pillow.” You can download the wif files of the profile draft and the thread-by-thread draft of the four blocks from the Complex Weavers website at this link. This entry was posted on January 5, 2018 at 8:50 pm and is filed under Double Weave, inlay, Lampas, Moorman technique, Profile Drafts. You can subscribe via RSS 2.0 feed to this post's comments. Eva, I was thrilled to see your beautiful lampas interpretations. I am so happy you found my monograph useful, and I look forward to seeing many more lampas productions from your looms. Happy New Year to you too! Alice, thank you so much! I could have never figured out lampas without your help not to mention how much fun I had. Please keep on writing books and articles because your contributions to the weaving community are priceless! Thank you Eva for the explanation, so beautiful. Eva, your weaving in always so inspiring! Thanks for sharing. Eva, thanks so very much for this insightful post. Your blog is an on-line weaving class! And you create such beautiful designs. Thank you to everyone for your comments, I appreciate it very much! Beautiful pillow. I’m about to take a class on lampas, and look forward to rereading your blog after the class. How many shafts did you use for your pillow? 16? Hi Joanna, thank you for your comment! I used 11 shafts and 9 treadles for this 4-block tied lampas – 3 shafts are needed for the secondary 3-end straight twill warp and 8 shafts are needed for the plain weave primary warp. 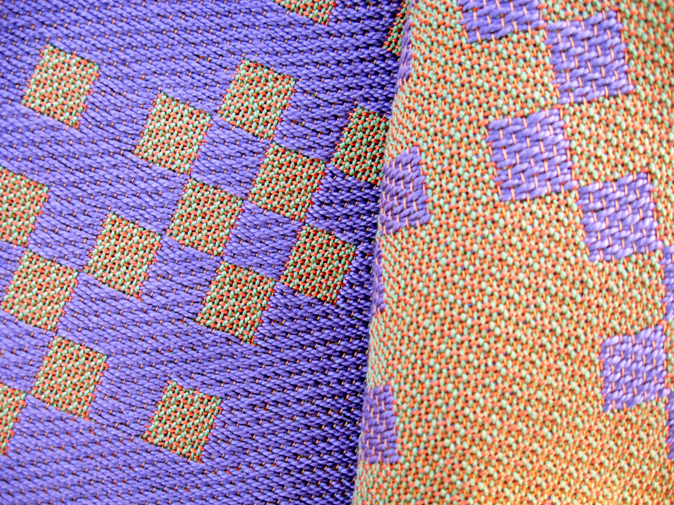 The tie-up is a skeleton tie-up and 2 treadles have to be used together for each weft shot with this kind of tie-up. Have fun with your class on lampas, it’s a lot of fun! Hi Eva, I always find your blog so informative and useful. Thank you for posting your experiments, drafts and analysis. Hello Eva – I am admiring the beautiful pillow you have pictured in this article. Would you please explain how you inlaid the yellow and purple in place of the coral pink? Hi Adah, thank you for your comment! I threaded the yellow and purple each in separate blunt tapestry needles. Whenever I wove a coral pink I inlaid these other colors with the needles in the areas I wanted them to cover. These inlaid colors, unlike the loom-controlled coral pink, basically only show on the front of the cloth and do not extend from selvedge to selvedge. If you click on the link I provided in this post about the Moorman Inlay Technique, you’ll get a better idea of how this is done. Awesome – this is so helpful Eva! I have a Lampas project threaded and ready to weave and when I saw those inlays I thought that they just add such a nice “pop” to the cushions. So I’ll give it a try. THANK YOU! Hello Eva – It’s me again. I hope you don’t mind me asking you another question. Did you warp your primary and secondary warp together using a paddle? I warped my primary warp, threaded it through the dents then warped the secondary warp. winding was not pretty!! So I am wondering whether there is a better method? Adah, I’m glad you asked! I did use a paddle and put the 2 primary warp ends in one slot/hole and 1 secondary warp end in another. If you’re going to thread front to back then make sure you transfer the cross if you’re going to sley 3 ends in one dent. The 2 warp ends together won’t get tangled but I think that 3 together would get tangled when you start threading the heddles. Hope this helps! This really helps – thank you Eva!! I just have to tell you how much I love your blogs! THANK YOU for sharing all your knowledge. Can you show how you are weaving Double widt on16 shafts?Thanks. If you mean how to weave cloth that is twice the width of your loom then for a plain weave cloth you only need 4 shafts. 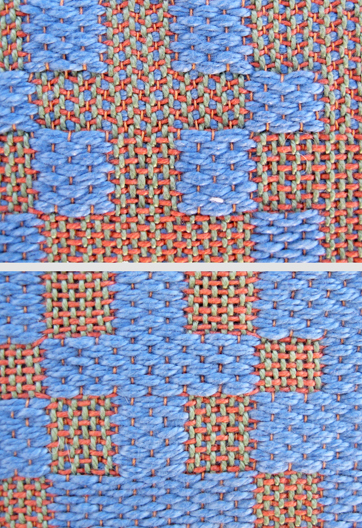 I explain this in an old post, “Double-Width Woolen Blanket in Plain Weave (with color-and-weave effects).” For most other weave structures you would need more than 4 shafts.